TDL is basically use as an additional add-on which provide you additional feature use in your Tally Accounts. TDL is use and can be make as per requirement. There is lots of TDL on internet which make your work easy. Some is very useful TDL and some are just basic TDL which will update by tally day by day. Today we discuss on a TDL which make your work so easy. This is all in one pack TDL. It contains to direct visit to Income Tax Website, GST Login Website, GST Cash Challan creation website, E-way bill login website. It also contains lots of shortcut key to open reports directly. Select Yes to Load TDL file on Startup and paste the file name here with extension and accept (save). 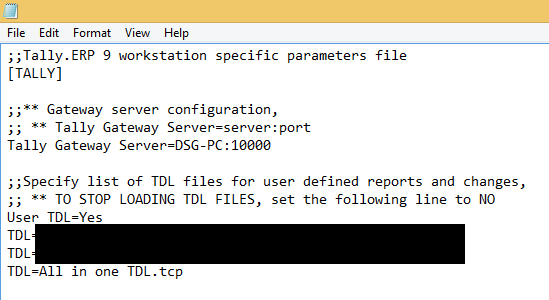 Second option to enter TDL is go to your Tally Installation Folder and open Tally.ini file, this is tally configuration file. Thankyou for your blog. It is very helpfull for the stock market traders.for more details you can also visit tips for stock market trading in india. error t0014 : attribute "fitch object not valid for "form"